Painful Periods are really painful and very common but they are not Normal! Stasha Washburn spent the first 20 years of her menstruating life HATING her period. Imagine explaining that to your friends in high school. She used the food poisoning excuse until she couldn’t use it anymore. Who gets food poisoning every 28 days or so? Stasha no longer spends her days dreading her periods. In fact, she LOVES her periods now. So much so that she calls herself, The Period Coach. 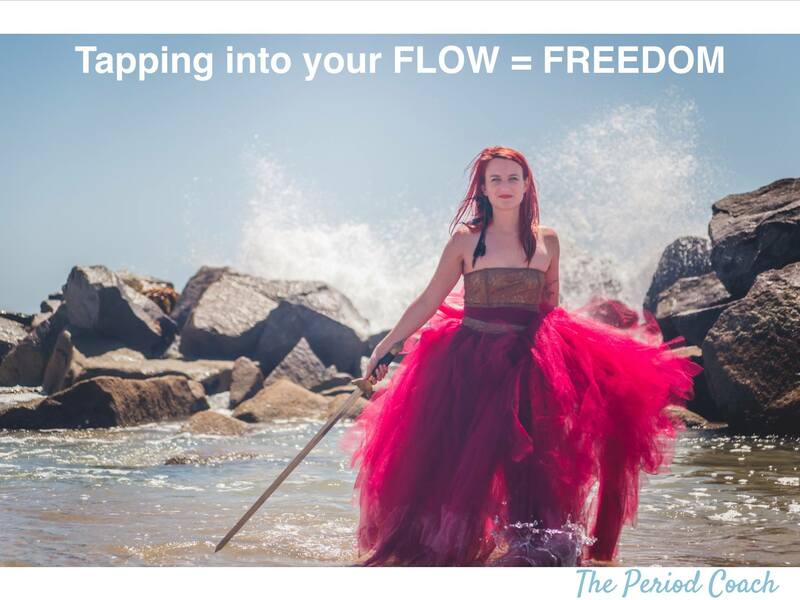 Stasha Washburn is the founder of ThePeriodCoach.com and coaches Entrepreneurial Women who want to enjoy PMS-free periods and to learn and harness the power of their periods to operate their business in the FLOW! Stasha blends scientific research with a feminine ceremony to create a unique mind, body, energy approach in her coaching. A healthy period is not painful. I am the living proof of that. Cramps, bloating, headaches, migraines, all these painful symptoms are an indication that there is an imbalance in your body. Tip: Use Clary Sage essential oil in a carrier oil on your abdomen over your womb to help ease cramps. Clary Sage has been used by women throughout the centuries to help ease the pain, even in childbirth! As with any essential oil, be sure to test it on a small part of your skin before using to see if any irritation occurs. Just like pain, if you get extremely moody or bitchy as you get closer to your period, hormonal imbalances are most likely the culprit. Tip: Passionflower tincture can be very helpful in making overwhelming mood swings gentler. If you are charting your cycle daily add in good fiber like buckwheat after you ovulate until you get your period. Many women express a desire to eat sweet treats and junk food around their periods. I have also seen this notion being publicized as marketing campaigns for products and services. I hate this! It fuels our addictions and makes ALL our symptoms worse! Sugar is highly addictive, the more you eat the more you NEED. Tip: Rather than going on a junk food binge, set yourself up for success by keeping high-quality chocolate in your cupboards that’s not full of crappy sugar. Or make yourself a sweet treat like hot chocolate made from raw cacao and coconut milk, totally sugar-free and SUPER satisfying! Let’s debunk that myth right now. Period blood is actually one of the easiest and most visible indicators of your health. Brown blood, spotting, clots, really dark blood are all ways your body is trying to tell you that something is wrong. A healthy period blood is a beautiful bright red, even a little pink in color. Tip: Using a menstrual cup or sea sponge can make seeing your blood so much easier. It can be awkward and uncomfortable at first but they are SO much better for you (and the environment) than disposable pads and tampons! Plus many women report a significant decrease in cramps when they make the switch. I’ve got lots of resources for using these products if you have questions. On the contrary. In fact your period is full of power and it’s just waiting for you to tap into it. Our period gives us a natural calendar to be in tune with. Think of a month as the time from one period to the next. When we listen to our body, we know that within one month we get to enjoy the four seasons, the spring, the summer, the fall, and the winter. These seasons then tell us what are we best at, what types of work we should focus on, and what type of food nurtures our body the most. Tip: Try eating with your cycle. Print this picture out and stick it on your fridge. When you’re thinking about a snack or what to make for dinner try adding something in that you like! When asked about her opinion on the prevalent taboos and stigma around periods, here’s what Stasha had to say. Stasha along with Illustrator Chantelle Valerie has created Enter The Red Circle Mandala and Daily Planner to help women see and understand their period patterns and help balance their hormones. Stasha believes that once women start to see their periods as their personal wellness barometer rather than a monthly painful inconvenience, ending the stigmas and taboos will get much easier.